Caught between revenge and redemption...With her family shamed and her faith shaken, Riley Drake carries a heavy burden. She returns to Bayou La Foudre Parish to clear her brother's name, but her mission proves difficult and dangerous. The locals are convinced he's guilty of the tragic bombing that left the town in mourning, and she finds her only ally is Jake Ayers. Frustrated and fascinated by the parish's brooding sheriff, Riley hopes she's found someone to trust with her burden...and her heart.Sheriff Jake Ayers wants peace and healing in his parish, but Riley's presence stirs tempers into a frenzy. Most of the townsfolk want her dead. Emotions run deep in the bayou, and Jake's are no exception. Keeping a level head and an indifferent heart is going to be as difficult as keeping Riley alive. 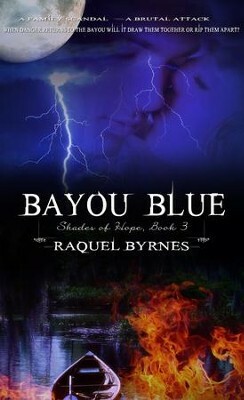 I'm the author/artist and I want to review Bayou Blue - eBook.